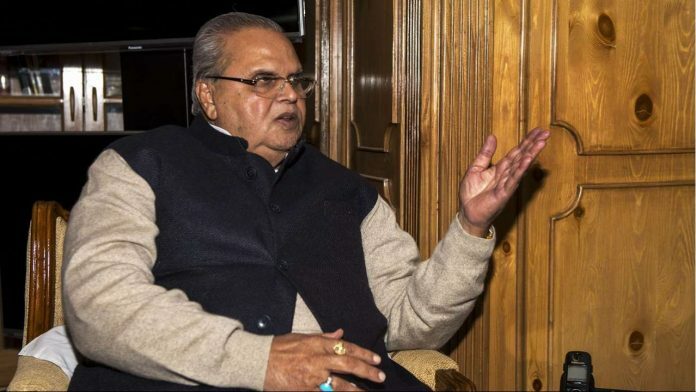 Srinagar, Jan 12 : Jammu and Kashmir Governor, Satya Pal Malik on Saturday said that atmosphere in Kashmir is peaceful, saying that the militants have failed to vitiate peaceful environment in the Valley. As per Kashmir News Service (KNS) correspondent, talking to reporters in Jammu, Governor Malik said that Pakistan is frustrated after the peaceful conduct of Panchayat polls in Jammu and Kashmir. “The militants were asked by their chief to vitiate the peaceful environment in the Valley but they failed to do so as the forces with the help of people, who are supporting us, foiled their plans,” he said. About the killing of Army men including a major on LOC, the Governor called it as ‘frustration of Pakistan’, saying that the forces are giving them (Pakistan forces) a befitting reply on border and the infiltrators are not being allowed to cross the border, adding these attacks are the outcome of successful conduct of Panchayat polls that indicates the ‘frustration’ of Pakistan. “I don’t know what he has done in IAS and what he is going to do in politics but I would like to wish him a well,” he added.